GH3DPC-483 | Size: 30 ml / 1.0 fl.oz. 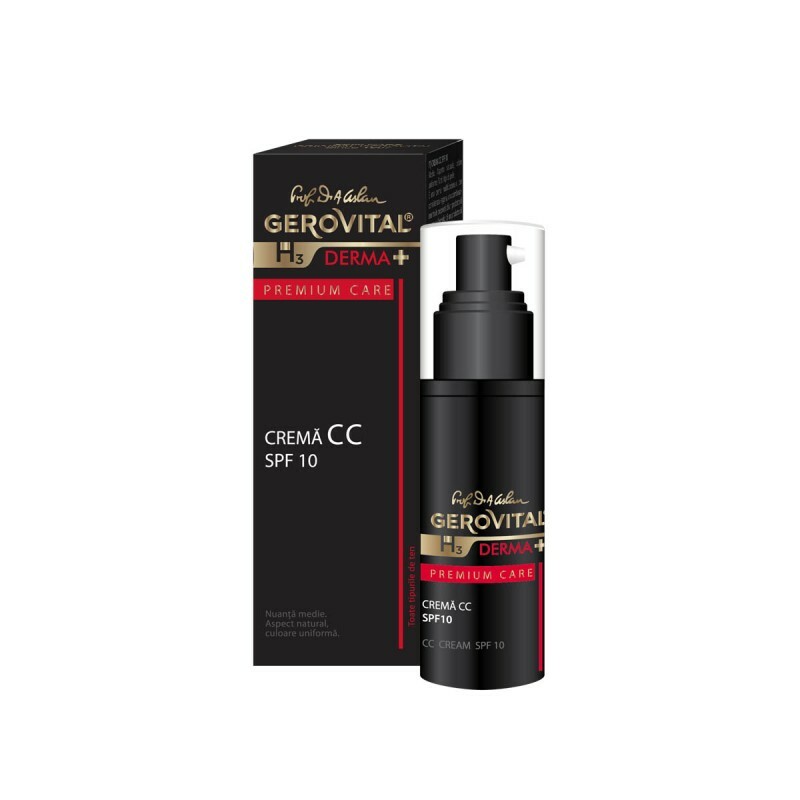 The CC cream is a multipurpose product which combines the properties of a make-up product with the benefits of an anti-aging line moisturizer. Formulated with broad-spectrum SPF10, it has a light texture and a medium tone, leaving a natural, flawless-looking complexion. It hydrates, protects, corrects and refines skin texture leaving a radiant fresh and flawless appearance. Matrixyl® synthe’6® increases the density and firmness of the dermis, fills in wrinkles from the inside for a visibly smoother and plumper skin. Restores skin’s metabolism of youth by stimulating synthesis of extracellular matrix components. Aquaxyl is an exceptional hydrating ingredient: it moisturizes and restructures the skin by increasing the content of Hyaluronic Acid. It prevents dehydration by improving the barrier function of the skin. Usage: Apply in the morning, to cleansed face and neck. Smooth evenly over entire face, paying special attention to areas of concern. Use gentle, circular motions from the center of the face toward outside. For an efficient removal, use the Micellar Gel. Apply in the morning, to cleansed face and neck. Smooth evenly over entire face, paying special attention to areas of concern. Use gentle, circular motions from the center of the face toward outside. INGREDIENTS: AQUA, CYCLOPENTASILOXANE, ZINC OXIDE (NANO), GLYCERIN, ETHYLHEXYL METHOXYCINNAMATE, ISONONYL ISONONANOATE, OCTYLDODECANOL, C12-15 ALKYL BENZOATE, HYDROXYETHYL ACRYLATE/SODIUM ACRYLOYLDIMETHYL TAURATE COPOLYMER, TRIETHOXYCAPRYLYLSILANE, XYLITYLGLUCOSIDE, ANHYDROXYLITOL, XYLITOL, ETHYLENE/PROPYLENE/STYRENE COPOLYMER, SORBITAN OLEATE, OCTYLDODECYL XYLOSIDE, PEG-30 DIPOLYHYDROXYSTEARATE, POLYSORBATE 60, 2-PHENOXYETHANOL, ETHYLHEXYLGLYCERIN, HYDROXYPROPYL CYCLODEXTRIN, PALMITOYL TRIPEPTIDE-38, PARFUM, DISODIUM EDTA, BHT, CI 77891, CI 77492, CI 77491, CI 77499.